Toffee is a gentle, 4-year-old, Shepherd mix with dark carmel-colored doe eyes. She loves a good long walk and will keep pace with you, not pulling or tugging. 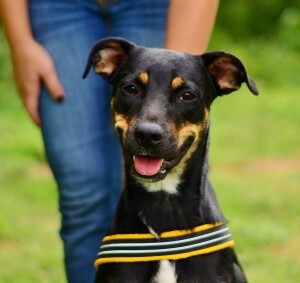 She came to the shelter as a stray wearing a spiked collar and sporting several injuries. She looked rough, tough, and scary, but it was quickly realized that she was, instead, sugary sweet and loving. During her road to recovery, she endured much medical poking and prodding with Job-like patience and now she’s in ship shape and ready for a new home. Visit her at the Animal Shelter and you’ll find her she’s sitting pretty and patiently awaiting your attention and kindness. She’ll return the gesture with unconditional love and enduring loyalty. Perhaps it takes a lifetime to deeply understand all of life’s lessons. This must explain how Muriel became so patient and kind. 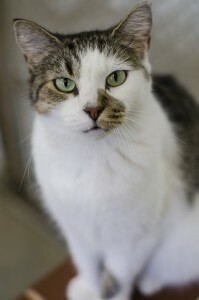 Muriel is a 10-year-old brown and white Tabby who has all the finest virtues you could ask of a house cat. She is already a master at living inside and she keeps her short coat and her living spaces spotless. Her personality soothes those around her and Muriel has this effect on people, as well as other pets. Her spirit isn’t dampened, but why should such a kind and gentle feline spend one more moment without a family of her own? Compassion and companionship embraces all ages of pets and the lucky family that brings Muriel into their home will learn just how priceless unconditional love can be.